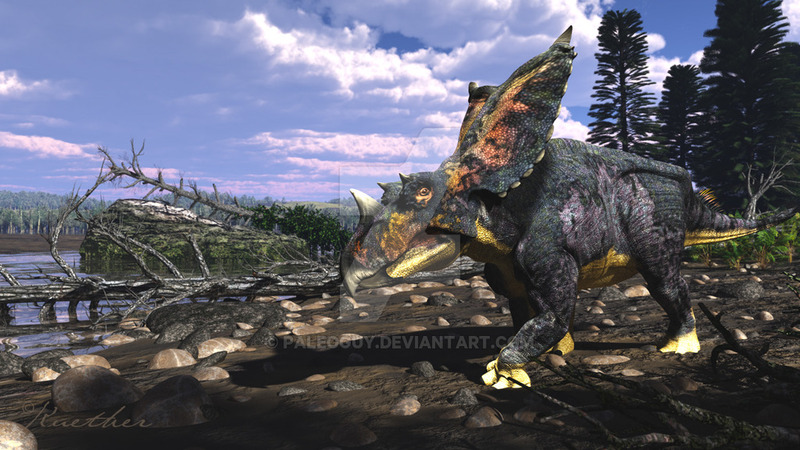 Chasmosaurus was a dinosaur which lived approximately 67 to 70 million years ago during the late Cretaceous Period. It was first discovered in 1898 by Lawrence Morris Lambe around Alberta, Canada. In 1913, Mr. Lambe found another species of this genus, so he decided to name all of his finds Protorosaurus, but found out the name was used for another a reptile species in the 19th century. 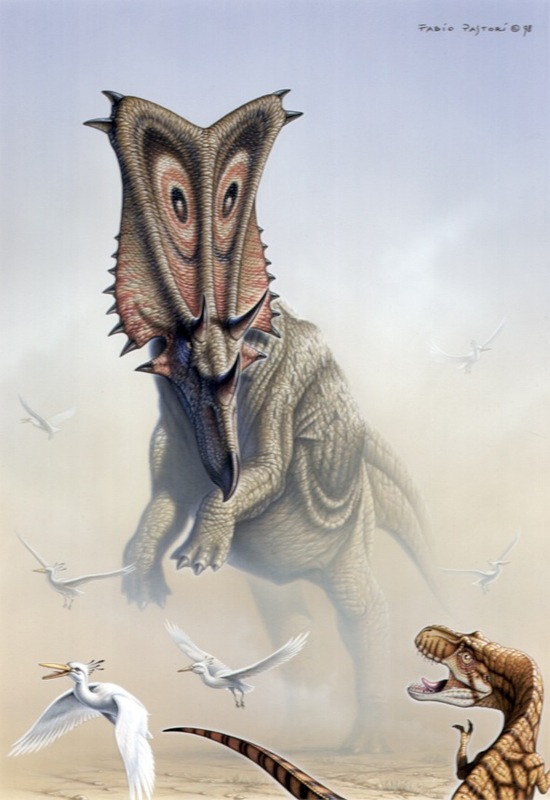 That is when he decided to name it Chasmosaurus—a name which means “opening lizard”–which he did in 1914. 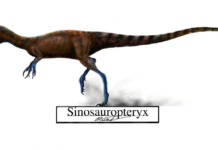 The name refers to the fact that this dinosaur had openings in its frill. 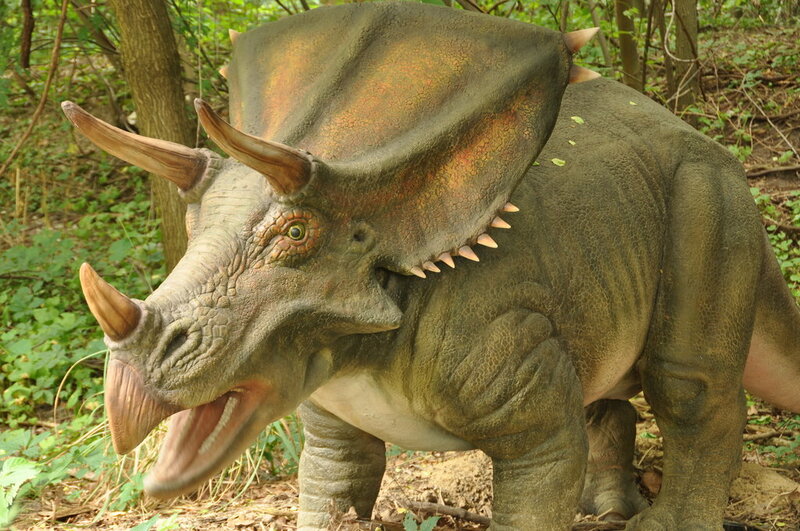 This dinosaur looked very much like a rhinoceros. 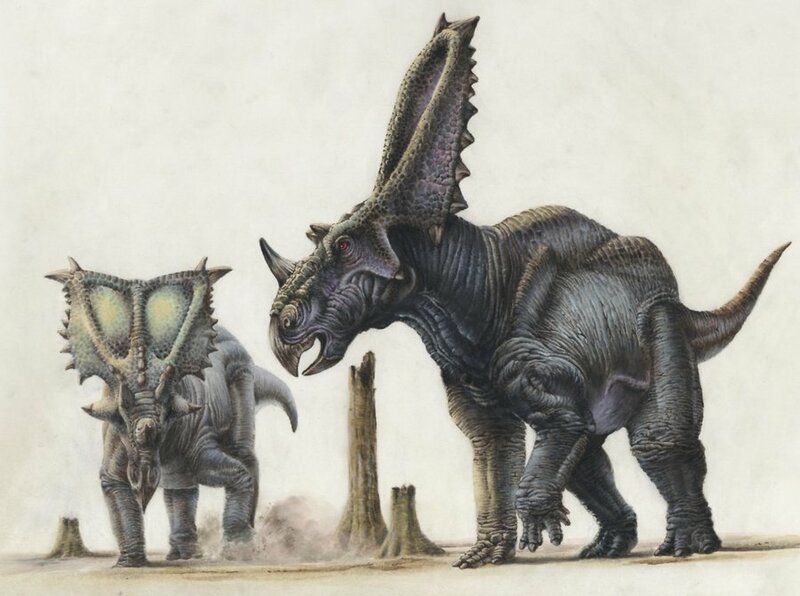 It had a big frill made of bone emanating from the back of its skull and it had three horns on its face. It had a thick barrel shaped body that was 26 feet long and weighed approximately 3.5 tons. 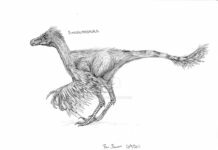 It had short legs that had 5 toed feet and a short tail. 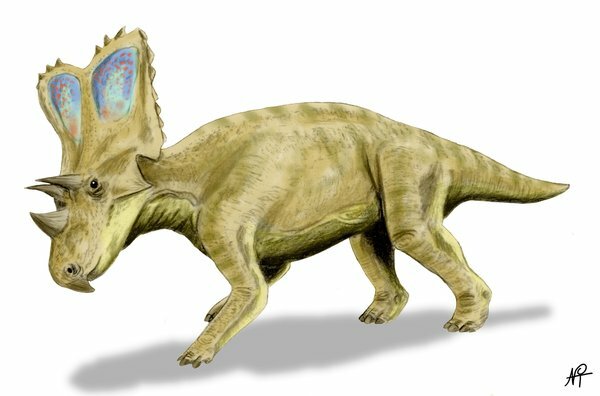 Its bony frill and extra horns, as well as its size, distinguishes it from a rhinoceros, but its toothless beak did as well. 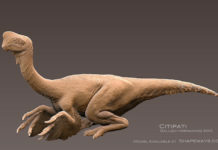 However, while it didn’t have teeth in its beak, it did have cheek teeth which would have been used to grind up all kinds of different plant material. 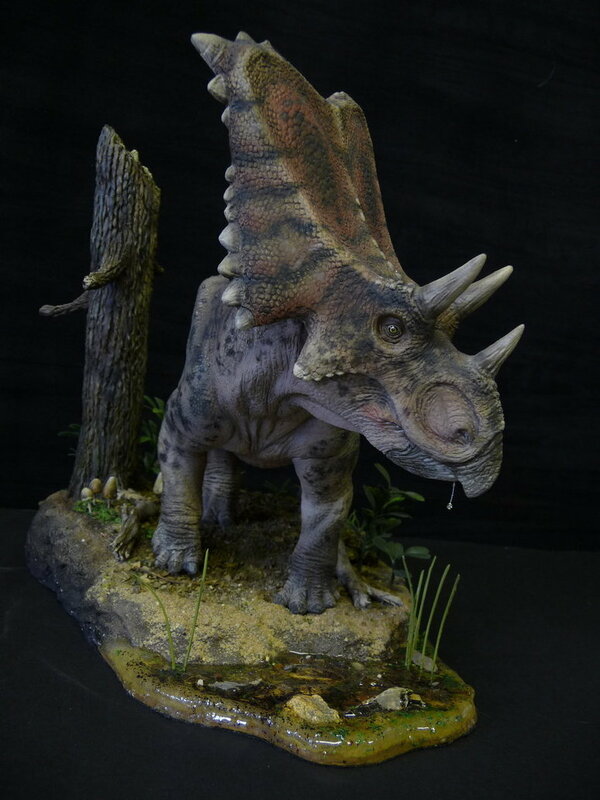 There are a number of interesting facts about Chasmosaurus that have been discovered by paleontologists. For instance, it is now known that this dinosaur hatched from eggs and may have taken care of those eggs. This is in stark contrast to what paleontologists used to think about dinosaurs. In the past, it was assumed that these massive animals didn’t take care of their young. Now that is beginning to look like a false assumption. This dinosaur might have taken care of its young and may have traveled in large herds. This would make it quite a social dinosaur. 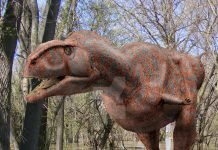 This dinosaur was an herbivore, so it ate a lot of different plants—which it would then have easily chewed with its cheek teeth. 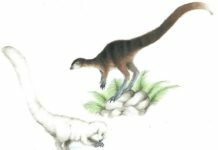 Some of the plants of the time this dinosaur may have eaten may include seed ferns, cycads and other types of plants. 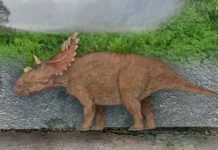 Paleontologists now believe that Chasmosaurus could protect itself in much the same way a rhino does—by running at full speed and butting the predator with its massive, armored head. This would have been a very effective defense indeed and probably helped this dinosaur fend off some of the nasty carnivores of the time.